“Has anyone brought in my dachsies?” a distraught — but still hopeful — Knysna resident queries as he rushes into the town’s animal-rescue shelter. He has just lost everything in the hellish, early-June fires ripping through the historical Western Cape town. But his home and possessions are insignificant compared with his irreplaceable dachshund companions. Elsewhere, the man’s girlfriend is stumbling through the smoked-up streets, repeatedly calling after the dogs. They’ll magically emerge from this dystopian dust — they must, they must — she keeps reassuring herself. If anyone has turned them in, he knows they must be here, at the shelter. “I’m sorry, I … no,” is all manager Annelien Kitley can offer, amid hosing down the building to brace it against the approaching flames, and taking in emergency cases by the minute. Trapped as they are at the edge of town, will she and the tens of dogs, cats and other animals in her care live to see sunrise? She has sent home most of the workers, except skeleton staff. Still, she has the presence of mind to ask for his contact details. They’ll call him. “I … I don’t know … my phone was burnt,” the man splutters. There’s nothing for it: he’ll have to come back another time … maybe tomorrow? Kitley looks on helplessly as he melts into the carroty dusk outside. Ten, perhaps 20, minutes later, the South African Police enter reception carrying two wary dachsies — Kitley wastes no time trying to soothe them with her obligatory dose of Rescue Remedy. The dachsies’ arrival would have been scripted to Disney perfection — if only they had turned up a moment or two before. Now the owner might be gone for good. But a hunch — or perhaps it is sheer hope — sends Kitley’s office manager racing into the parking area, only to find the devastated man has not left: strapped up for a drive to nowhere in a burning town, broken down over his tightly gripped steering wheel in racking sobs. “We got the dogs,” comes the whisper through the window. And the sun had not even set yet on the nightmarish night to follow, punctuated by the horrific soundtrack of “things exploding in town”. “It was rough,” is all Kitley can offer. Or, put it this way: imagine being at home as your neighbourhood turns to charcoal during an uncontrollable fire — fanned by some of the greatest winds in generations. For the sake of your family — your life — you know you should leave, and yet destitute community members keep turning up with their pets, begging you to take them in: you’re their only hope. What would you do? For Kitley, abandoning the 50-odd, and growing, number of animals at the shelter to save her own life was not an option, even as the trees on the property started caving in. While attending to the distressed pensioner, Kitley heard a sickening sound outside: a resounding, drawn-out crack, followed by a thud. It was coming from near the animal clinic. Both sides of town had been closed off by the seemingly boundless, fateful fire that mysteriously erupted on June 7 — and would ultimately incinerate 100-odd kilometres of world-famous Afromontane woodland, strand thousands of people, claim several human lives, and kill many domestic and wild animals. By midnight Kitley had not had a moment’s rest. The phone lines were “down” and they had lost cellphone reception. She and her brave smattering of staff heroes were on their own. It seemed there was not a cat’s chance any of the sister shelters in neighbouring towns would reach them that night to evacuate the animals pouring in through the door. The smoke was “so bad” Kitley, her staff and the animals breathed with “great difficulty”. At thirty past midnight: a miracle. 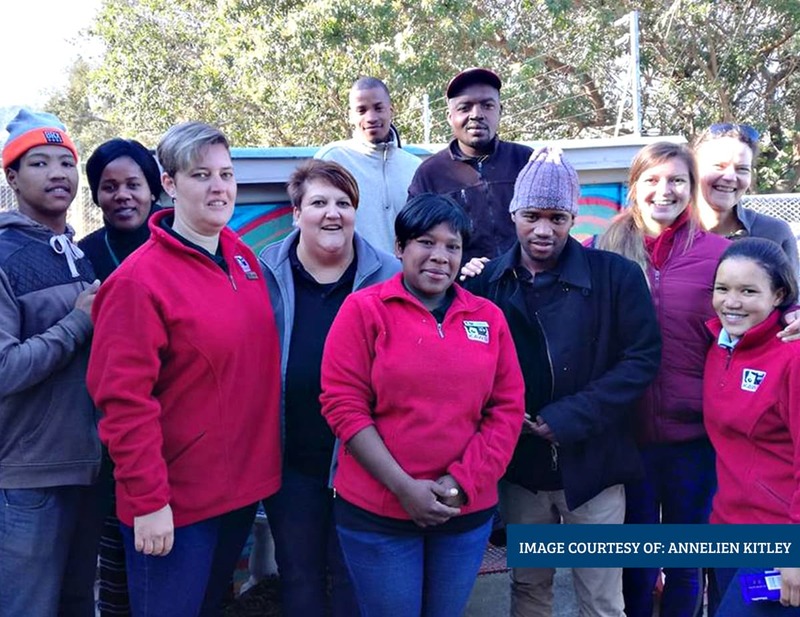 When the SPCA group in neighbouring George could not reach Kitley by phone, they gathered a small army of vehicles in the small hours, and drove 60 kilometres east towards Knysna, where they waited at the infernal barricades before emergency services would let them through. 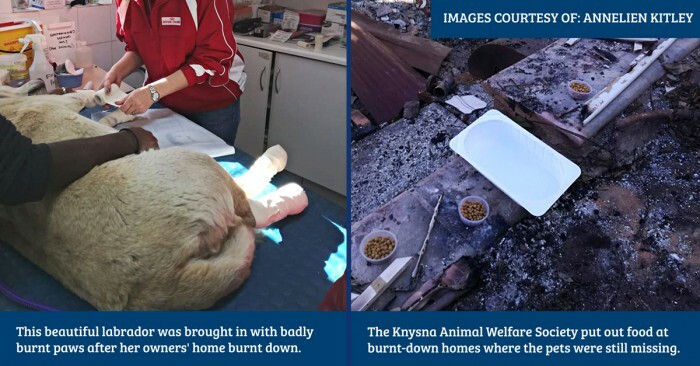 During the next few weeks, as the fires died, flared up and subsided again, help came from all over South Africa, as well as pharmaceutical companies and animal lovers in the United Kingdom and US, in the form of financial donations, burn-wound medication, antibiotics, painkillers, dog food, blankets, bowls and leads. Kitley, her staff and local veterinarians have treated and safely homed so many animals that she has lost count of the patient list. The motley mix has included a pony, some 30 geese and 50 chickens. “I’m only getting back to some kind of routine now. We’ve been working nonstop. We even had a pig sleeping in the dog kennel… we are still looking for his owner,” says Kitley. Reflecting on the transformative experience of the past weeks, she says: “My staff are awesome. No one moans to work extra hours — they just keep going, transporting bakkie-loads of food all over town. Their bodies are sore and yet we’re all still out there in the veld, looking for animals. Get in touch with any of the animal shelters affected by the 2017 Cape disasters.